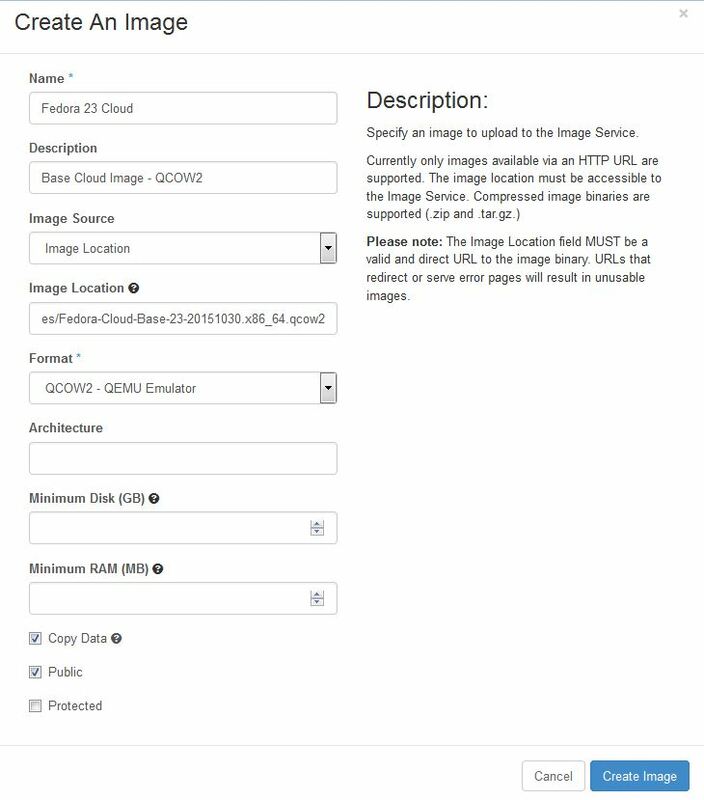 This post will cover the retrieval of base or cloud OS images via the Openstack Glance image service and how the Acropolis driver interacts with Glance and maintains the image data on the Nutanix Distributed Storage Fabric (DSF). It has the ability to copy (or snapshot) a server image and then to store it promptly. Stored images then can be used as templates to get new servers up and running quickly, and can also be used to store and catalog unlimited backups. The Acropolis driver interacts with the Glance service by redirecting an image from the Openstack controller to the Acropolis DSF. Aside from any image metadata (ie: image configuration details) being stored in Glance, the image itself is actually stored on the Nutanix cluster. We do not store any images in the OVM, either in the Glance store or anywhere else within the Openstack Controller. Images in Openstack are mostly downloaded via HTTP URL. Though file upload does work. The image creation workflow in the screenshot below shows a Fedora 23 Cloud image in QCOW2 format being retrieved. I have left the respective “Minimum Disk” (size) and “Minimum RAM” fields blank – so that no minimum is set for either. 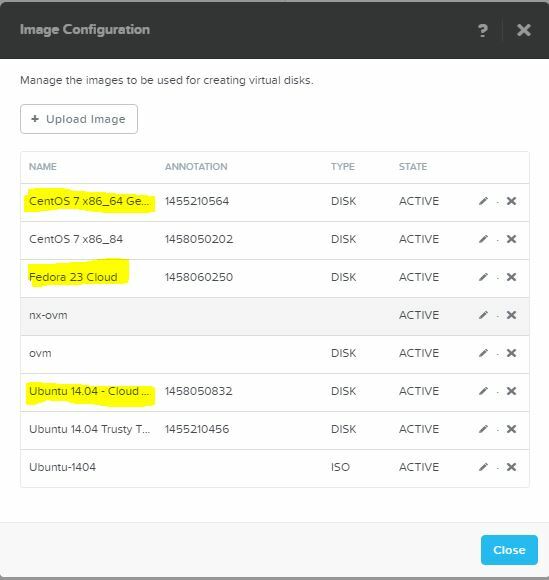 You can confirm the images are loaded into the Nutanix Cluster backend by viewing the Image Configuration menu in Prism. The images in Prism are stored on a specific container in my case. Similarly, Prism will report the progress of the Image upload to the cluster through the event and progress monitoring facility on the main menu bar. If all you really need is a quick demo perhaps, then Openstack suggests the following OS image for test purposes. Use this simply to test and demonstrate the basic glance functionality via the command line. Works exactly the same if done via Horizon GUI, however. One other thing to be aware of is that all network, image, instance and volume manipulation should only be done via the Openstack dashboard. All the Openstack elements created this way can not subsequently be changed or edited with the Acropolis Prism GUI. Both management interfaces are independent of one another. In fact the Openstack Services VM (OVM) was intentionally designed this way to be completely stateless. Though obviously this could change in future product iterations, if it was deemed to be a better solution going forward. Next up, we will have a look at using the Acropolis Cinder plugin for Block Storage and the Nova Compute service integration. This entry was posted in Acropolis, AHV, Cloud, DevOps, Openstack and tagged Acropolis, CirrOS, Cloud, Distributed Storage Fabric, DSF, Fedora, Glance, HTTP, Images, Nutanix, Openstack, Openstack Controller, Openstack Services, OVM, Prism, Ubuntu, URL on 6th April 2016 by Ray Hassan.